Coming Soon! Licensed Wizard of Oz Collectible Products are here. by Harlan Ellison and other Oz experts. The quintessential American fantasy celebrates its 100th anniversary in this definitive series. Following the success of The Wonderful Wizard of Oz, author L. Frank Baum produced a sequel, The Land of Oz, in which he introduced a whole new set of characters. 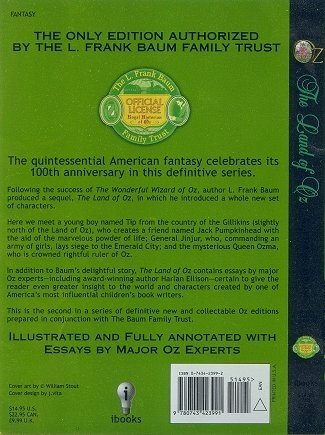 In addition to Baum's delightful story, The Land of Oz contains essays by major Oz experts-including award-winning author Harlan Ellison-certain to give the reader even greater insight to the world and characters created by one of America's most influential children's book writers. 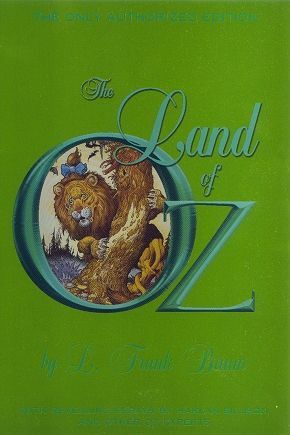 This is the second in a series of definitive new and collectible Oz editions prepared in conjunction with The Baum Family Trust. 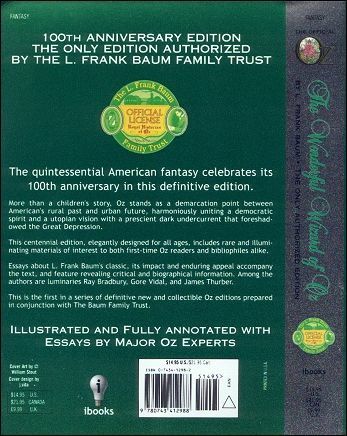 The only edition authorized by the L. Frank Baum Family Trust. fully annotated with essays by major Oz experts. The quintessential American fantasy celebrates its 100th anniversary in this definitive edition. More than a children's story, Oz stands as a demarcation point between American's rural past and urban future, harmoniously uniting a democratic spirit and a utopian vision with a prescient dark undercurrent that foreshadowed the Great Depression. 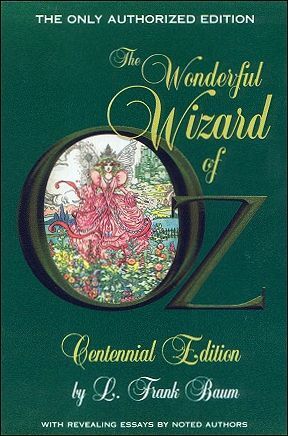 This centennial edition, elegantly designed for all ages, includes rare and illuminating materials of interest to both first-time Oz readers and bibliophiles alike. Essays about L. Frank Baum's classic, its impact and enduring appeal accompany the text, and feature revealing critical and biographical information. Among the authors are luminaries Ray Bradbury, Gore Vidal, and James Thurber. This is the first in a series of definitive new and collectible Oz editions prepared in conjunction with The Baum Family Trust.